Being a mother can be a hard job, but we can’t imagine what it’s like to be a mom and first lady of the United States. For Ebony’s May “Mother’s Day” issue, Michelle Obama sat down to talk about how she handles motherhood, being the president’s wife and her work duties, which include helping the nation’s children get fit and healthy through her “Let’s Move” campaign. Luckily, FLOTUS has help around the big house. Her mom, Marian Robinson, also lives with the family and helps out by picking up granddaughters Malia, 13, and Sasha, 10, from school, by attending their events when their parents are too busy and by offering Michelle support if she ever needs it. “Anytime I need to go and plop on her couch and just talk, she’s always there,” Michelle said. And even though they have a nation to lead and people riding on their every decision, raising their children remains their most important task. The issue hits newsstands April 17 and features celeb mom photos including Tina Knowles, Solange and her son, Jules, as well as Beverly Johnson’s family. 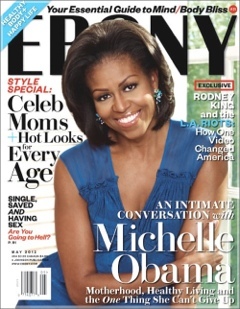 On the cover, Michelle looks lovely in a royal blue Tracy Reese dress.